SAN FRANCISCO, Calif. (August 26, 2018) – Nicole Breault (San Francisco, Calif.) ran the table at the U.S. Women’s Match Racing Championship, hosted by St. Francis Yacht Club, August 24-26. Without a single loss, Breault and her St. Francis Yacht Club (StFYC) crew of Molly Carapiet (San Francisco, Calif.), Hannah Burroughs (San Francisco, Calif.) and Karen Loutzenheiser (Santa Cruz, Calif.) successfully defended their 2016 title. U.S. Womens Match Racing ChampionshipAllie Blecher (Long Beach, Calif.), sailing with Ali Blumenthal (Bethport, N.Y.), Beka Schiff (San Diego, Calif.) and Molly Noble (Hood River, Ore.) for California Yacht Club, fought hard for second in a tiebreaker semi-final against Janel Zarkowsky (Annapolis, Md.). “It was the frosting on the cake, to have run the table, but it wasn’t my expectation. I knew either Allie and Janel, coming out of the semi-finals, would be tough. We had to be ready,” said Breault. Breault, along with Carapiet and Loutzenheiser, also won the Allegra Knapp Mertz Trophy in 2015. With the win, Breault is invited to compete at the 2018 U.S. Match Racing Championship, hosted by the Chicago Yacht Club on October 19-21, 2018. She had already qualified to represent the U.S. at the 2019 Nations Cup Grand Final. Breault is the #1 ranked women’s match racer in the country and #8 in the world. Eight teams were whittled down to two during three stages of match racing on San Francisco Bay. Commencing Friday with a round robin to determine seeding, racing was initially delayed due to light winds – a rare occurrence on these waters. This allowed for a little extra practice in the J/22s provided by StFYC. By Saturday there was enough breeze to power the teams rapidly through the rounds, with Breault picking off one after another to remain on top. Blecher’s team said they were enjoying the bay’s breeze-on conditions and sorry to see the Race Committee remove spinnakers when the wind reached upper limits, “though it was the right call,” said Blumenthal. Sunday once again dawned light and shifty for the semi-finals, which would determine seeding for the final and petit final. Marilyn Cassedy (Los Angeles, Calif.) won her pair against Stephanie Wondolleck (San Rafael, Calif.) to advance, but lost against Breault, finishing fourth overall. The battle between second and third came down to a tiebreaker between Blecher and Zarkowsky. Blecher led during the first upwind and gained further when Zarkowsky scored a penalty on the downwind run. A tacking duel on the second upwind made for a close rounding and sailing down the course. Just short of the finish, Zarkowsky dropped the chute and smoothly executed a jibe, but it failed to fully clear the penalty, allowing Blecher to advance to the finals against Breault. The light, shifty winds settled into a steady 15 knots heading into the final, where the first race was a textbook example of Breault and her crew’s prowess. Blecher had the better start and a solid lead, but Breault clawed up her back, tack for tack, eventually seizing control and owning the first rounding. Her dialed deck crew had the spinnaker set and filled to lock in a solid lead they held to the finish. Race two again saw Blecher control Breault through the pre-start and carry the lead all the way to the windward mark. Breault, on the hunt, shadowed her chute forcing her off to starboard. Blecher was awarded the Mrs. Charles Frances Adams Perpetual Trophy, and as the top finisher of the event who hadn’t previously qualified for the Nations Cup, she will be nominated by US Sailing to participate in the 2019 regatta, also hosted by St. Francis Yacht Club. 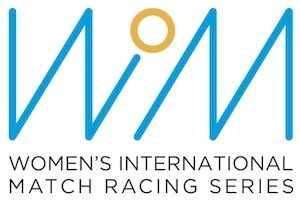 The U.S. Women’s Match Racing Championship was sponsored by Gill, with prizes for top finishers provided by Hobie Cat and gifts for the umpires from Cameron Hughes Winery. Randy Smith conducted a match racing clinic with the participating sailors on Thursday, August 23. For results, standings, photos, Twitter updates, and more information from the 2018 U.S. Women’s Match Racing Championship, please visit the event website.